Yes, Enrique Iglesias and his beautiful girlfriend became proud parents this Saturday. Anna Kournikova did not only give birth to a child but twins. Now the couple can each hold a child as long as they want. Our favorite singer and his longtime girlfriend will be pretty busy with their new cute little babies for a while now. Yes, the new mom and dad are on the journey of becoming parents. Some celebs are not slightly modest showing off their baby bump but it was not the case for Anna Kournikova. Rather it was the opposite. Not only Anna but her boyfriend, Enrique also went off the grid when she got pregnant. We understand that they did not want paparazzi following them everywhere with the unborn kids. They wanted space. Hence, the news of Anna's pregnancy, you might say was a well-kept secret. The last picture of the duo was seen together in a picture taken with Anna's little brother. There were assumptions that Anna's pregnancy was the reason for pulling themselves out of the media world and damn they were right. Often when celebrities get pregnant they wear oversize t-shirt, sweaters, pullovers or jackets. Likewise, the former tennis player also covered her fit body with oversize tees, tops, jackets and even her dog. When Anna had a perfect sized body. #saturdaynight #blackandwhite #lookofthenight as #usual #?????????????? #???????????? #????????? #hugs and #sunsets ???????? #????????????? ???? Moreover, people have become quite expert nowadays as they assumed that Anna Kournikova was pregnant with Twins. How can they tell? Well now they must be saying aloud like 'Look I told you so'. Finally, on 17th of December, Kournikova gave birth to a baby boy and a girl. Enrique and Anna named their twin babies, boy and girl, Nicholas and Lucy respectively. But they have not put pictures of the twins yet. The Bailando hit-singer met the Russian tennis player at the set of Enrique's Escape music video. 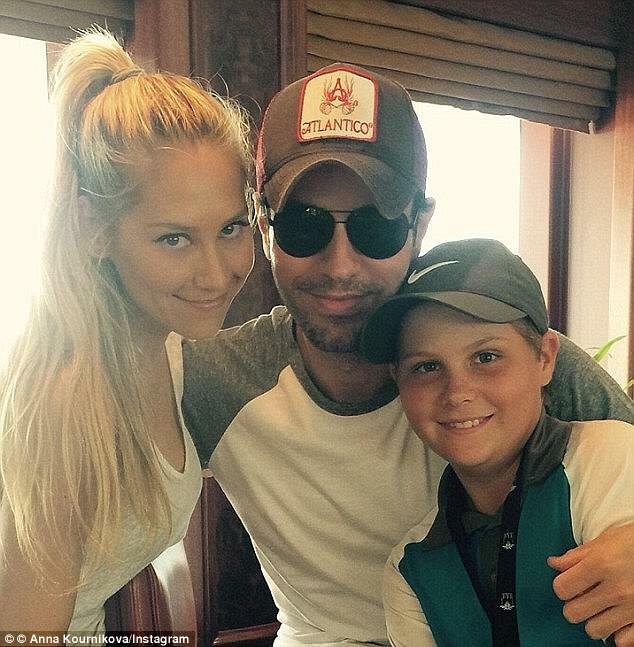 The Spanish 42-year-old singer and Anna Kournikova have been dating since 2001, making 16 years in total. There comes a point when you've been with someone for a certain amount of time that I believe that you are like, married. I guess the only difference is that we haven't walked down the aisle. In addition, his partner, Anna also agreed to him. The 36 year old blonde and mom told that as long as they are happy, getting married is the least concern for her. Listening to them, it appears like they will not get married any sooner. If they have survived 16 years without getting married, why should they get married?